With its checkered plumage, this seabird was likened to a pigeon by seamen aboard the whaling vessels around which it flocked: hence its traditional name, the Cape Pigeon. Its flight pattern consists of rapid wingbeats alternating with stiff-winged glides. To feed, it swims and reaches down or dives for small fish and other animals in the plankton. Cape Petrels breed in small groups or colonies on shores and islands. • NliST a shallow depression in a layer of loose rock fragments, on a rocky ledge, or in a crevice. 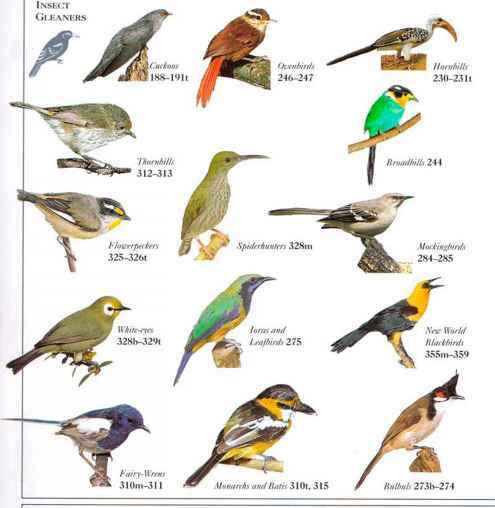 • Distribution Breeds on islands and coasts of southern continents. Winters on the southern oceans. Seen in fast, erratic flight over the ocean, this petrel is recognized by its hold wing markings. It floats on the sea to feed, snatching up small drifting animal life from the plankton. From a tiny breeding range, it journeys extensively over the ocean. When breeding, it comes ashore by night to avoid predators. • NliST A hollow in a burrow, usually high on a forested slope. • DlSTRIBl JTION Breeds 011 two small islands at opposite ends of New Zealand. Winters at sea over much of the Pacific Ocean. 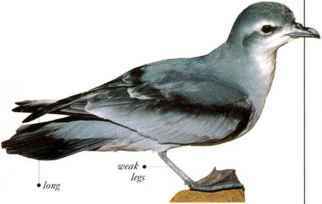 I his small petrel flies over the ocean for much of its life. It feeds in flocks by night, skimming the sea surface with its bill to scoop up small crustaceans, squid, and other animals. The bill is equipped with fine plates (lamellae) that filter these animals from the water. Fairy Prions land by night at their breeding colonies, which are always situated on small islands. Incoming birds utter soft, cooing calls as they arrive; if their breeding partners are in the burrow, they reply with similar calls. On land, they walk clumsily on weak legs, in a low, crouching gait. • NliST A burrow dug with the bill and feet in soil, often hidden among vegetation, or a hollow in a rock crevice. • DISTRIBUTION Breeds on coasts of southern continents. Winters at sea. legs are weak on land out at sea. This sparrow-size seabird flutters across the oceans with its legs dangling and often pattering along the sea surface. It feeds by picking tiny crustaceans, fish, and mollusks from the water. • NliST A hollow in a burrow, in a colony located on a slope overlooking the coast. • DISTRIBUTION Breeds on coast and on islands i-southern oceans. Winters far out at sea.